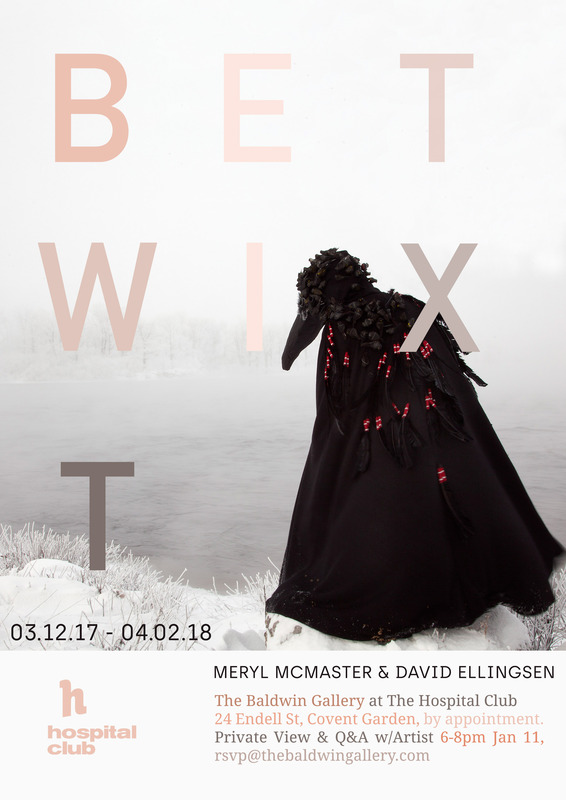 The Hospital Club presents The Baldwin Gallery’s Betwixt, exploring the organic and psychic transference between selves and species, featuring the shape-changing photography of David Ellingsen and Meryl McMaster. Of indigenous and European descent, Plains Cree sculptural-photographer, McMaster, pits delimiting identities – Native American, Canadian, female, human – against the immediacy of her lived body in the natural world. She expresses heritage and contemporaneity as a synergistic strength of unities, rather than a struggle between opposites. Ellingsen’s Anthropocene series is inspired by the proposed renaming of our geological epoch, as Earth’s systems are irrevocably altered by human activity. Transmuted skeletal remains, adrift on blackness, reference future and past and are both a warning and rendering of hope. Both artists have shown in museums around the world, from The Beaty Biodiversity Museum, Canada, and the Datz Museum of Art, South Korea (Ellingsen), to the Smithsonian and the Art Gallery of Ontario (McMaster).